WASHINGTON -- Protesters registered their rage against the new president Friday in a chaotic confrontation with police who used pepper spray and stun grenades in a melee just blocks from Donald Trump's inaugural parade. 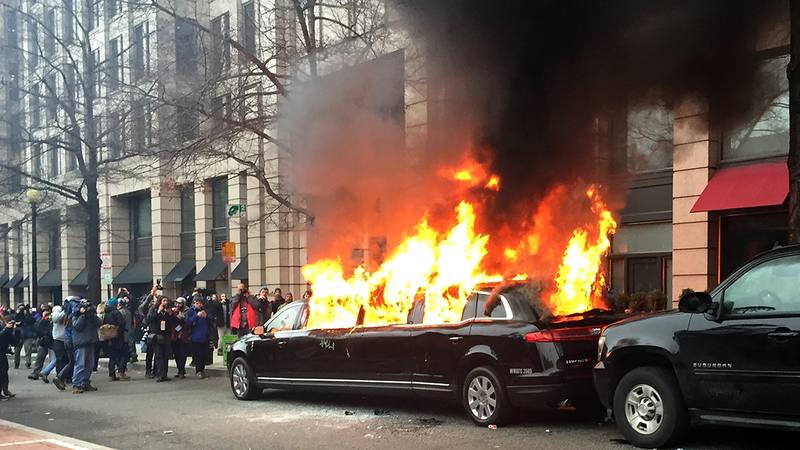 At least 217 people were arrested for rioting while a burning limousine sent clouds of black smoke into the sky during Trump's procession. But about a mile from the National Mall, police gave chase to a group of about 100 protesters who smashed the windows of downtown businesses including a Starbucks, a Bank of America and a McDonald's as they denounced capitalism and Trump. Police in riot gear used pepper spray from large canisters and eventually cordoned off protesters at 12th and L streets in northwest Washington. The limousine was attacked on the perimeter of the secured zone. 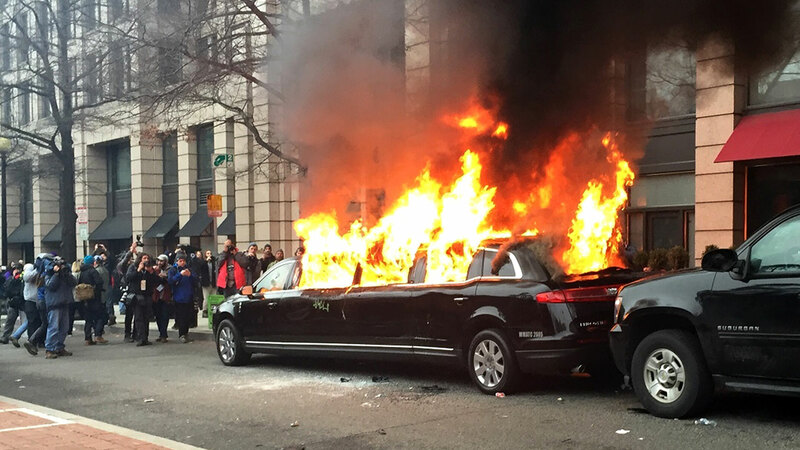 As Trump and his parade of celebrants moved along Pennsylvania Avenue, the vehicle was ablaze, tainting the air for blocks and sending protesters and passers-by moving swiftly away. As night fell, young protesters ignited a large bonfire blocks from the White House in McPherson Square. They carried signs like "Hail to the Thief" and hung an upside-down American flag as women in gowns and men in tuxedos passed by, presumably en route to one of the inaugural balls. Police said protesters damaged vehicles, destroyed property and set small fires while armed with crowbars and hammers. All 217 people arrested were charged with rioting, said Newsham, noting that the group caused "significant damage" along a number of blocks. National Guard and DC Metro PD on scene of vandalized businesses Friday.